Kitchen Window — How To Get To Sesame Treats: Open A Can Of Tahini This sesame-seed paste isn't just for making hummus and that tangy sauce on your falafel. Like butter or mayo but with a nutty kick, it's a rich addition to baked goods, a warm salad and more. Get recipes for Greens And Tahini Borek, Warm Butternut Squash And Chickpea Salad With Tahini and Sweet Braided Tahini Bread. If you were going to make a desert-island list for your refrigerator, it's unlikely tahini would make the cut. In fact, it might not even be in your standard mainland refrigerator, unless you regularly cook food with a Middle Eastern or hippie influence. Which is a bit of a shame. Because tahini is quite lovely, and capable of much more than we usually give it credit for. Deena Prichep is a Portland, Ore.-based freelance print and radio journalist. Her stories have appeared on Morning Edition, All Things Considered, Marketplace, The Splendid Table, Voice of America, The World and Northwest News Network, and in The Oregonian, Vegetarian Times and Portland Monthly. She chronicles her cooking experiments at Mostly Foodstuffs. For those of you who haven't had the pleasure of making its acquaintance (or, if you have, haven't looked too closely at the ingredients listed on the label of your jar), tahini is nothing more than sesame paste. There's a version made with toasted seeds, for a deeper flavor, or the slightly blonder, more neutral-tasting "raw" tahini. It has some of the richness of a nut butter, with a looser texture and subtler flavor. There can be a bit of confusion about what you're referring to, as we tend to use the term "tahini" for both the paste itself and the lemony, garlicky sauce made from it (also known as taratour in Arabic). Beyond stirring the paste into a batch of hummus, this sauce is frequently the only way we enjoy tahini. Tahini sauce is lashed onto falafel, adding a tangy, soppy counterpoint to the crunchy fried patties. 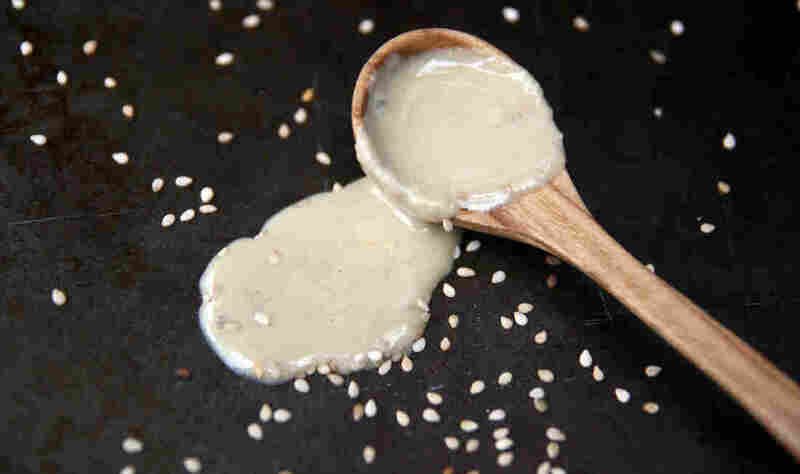 Or, if we're feeling a bit more adventurous, tahini sauce is paired with quinoa, or tofu or heartier salads. But if you start looking toward those cuisines that are more familiar with tahini — Lebanese, Turkish, Armenian, etc. — you'll find that it can go far beyond falafel. In much of the Middle East, tahini is seen as more of a workhorse building block than niche condiment. It's used in hummus and falafel sauce, sure. But it's also used almost in the same way we would use butter or mayonnaise, adding heft to both savory and sweet preparations. Tahini never hides its nutty nature, so it doesn't quite disappear in the same subtle way those other ingredients would. But the rich flavor can be surprisingly delicious in these new contexts (and a boon to those who want the luxuriousness but don't want dairy). As you can see from opening any jar or can of tahini, this is not a low-fat product — it's swirling with deliciously rich oil. But that's precisely why it works so well in so many contexts, adding depth to baked dishes and cold salads alike. And like other nut and seed butters, tahini's fats are those good fats — the omegas we're encouraged to consume. It also contains trace minerals, and fiber and calcium. More than that, it's just plain good. 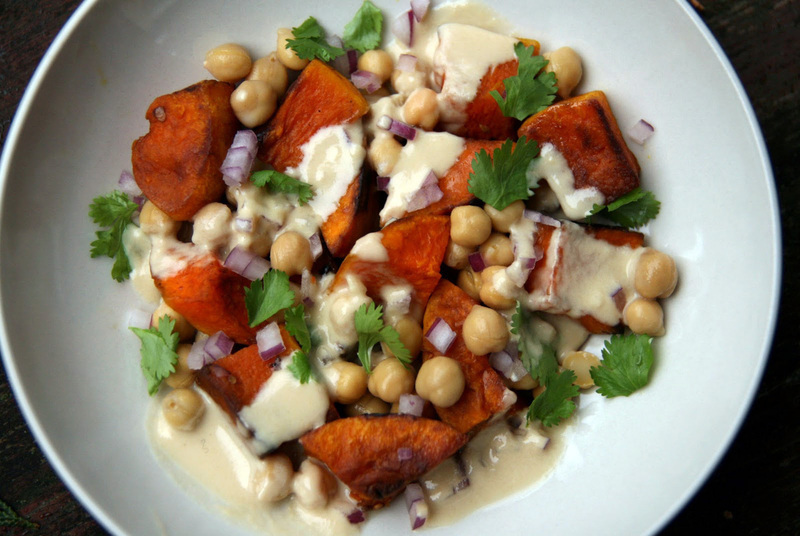 So try expanding your tahini horizons. Swirl it into sweet bread, or ladle it onto baked fish. Or, really, whatever you want. Sure, tahini may never make your desert island list. But it can find a home in a surprising range of dishes. 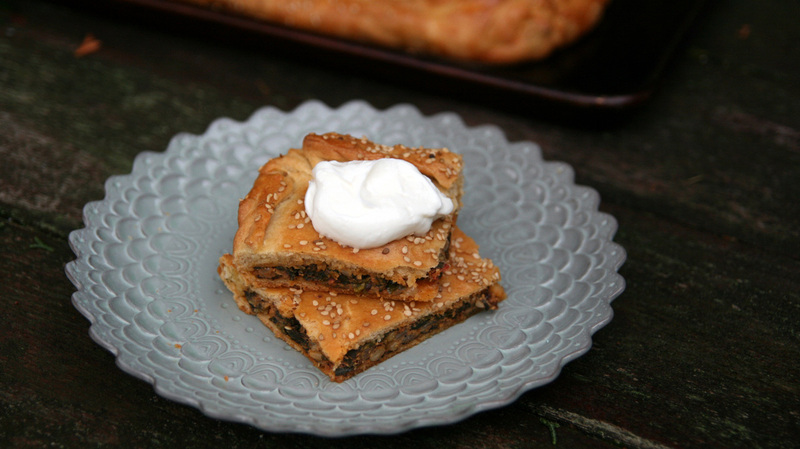 Many diners are familiar with feta-studded Greek spanakopita, or the sumac-tangy Middle Eastern fatayer. In this version, adapted from Armenian-Lebanese cookbook author Anahid Doniguian, greens are matched with a generous helping of tahini. The resulting pie has a surprising richness, which is perfectly matched by the tang of a dollop of thick Greek or Middle Eastern yogurt. This recipe takes advance planning. A day or two before you want to make the borek: Pour the water in a mixing bowl, and sprinkle in the yeast. Let sit for a few minutes to soften and bloom. Then add the olive oil and salt, and then add the flour, kneading it with a dough hook or by hand until it is smooth and supple and just clears the sides of the bowl, but still sticks to the bottom (add more flour as needed). Place in an oiled container, swish it around to coat, then flip it so the oiled bottom is on top. Cover and refrigerate at least a day, and up to 2 days. When you're ready to bake, take the dough out of the refrigerator and let it come to room temperature for half an hour. Preheat oven to 350 degrees F.
Heat the olive oil in a saucepan over a medium heat, and add the onions and a pinch of salt. Saute until translucent, about 5 minutes, then add the pine nuts and cook another few minutes until the onions and the pine nuts both begin to turn golden. Add the paprika, allspice, sumac and tomato paste, stirring to toast the spices. Then add the tahini and turn off the flame, stirring to melt/distribute evenly in the residual heat. Mix in the remaining filling ingredients, adjusting seasoning as needed. Divide the dough into 2 pieces, one slightly larger, and roll out the larger piece on a lightly floured countertop until it's almost the size of a sheet pan. Transfer to a baking sheet or casserole and top with the filling. Roll out the remaining dough, and place on top of the filling, tugging and pinching the ends to make them meet and seal (the dough is soft and should seal easily). Brush the dough with the beaten egg and sprinkle with the sesame seeds. Bake until golden and crisp, about 40 minutes. Let cool slightly, then cut into squares and serve, with a dollop of yogurt on top. This recipe, adapted from Casa Moro (Edbury Press, 2005), London's Spanish-influenced restaurant, is a perfect fall main-dish salad. 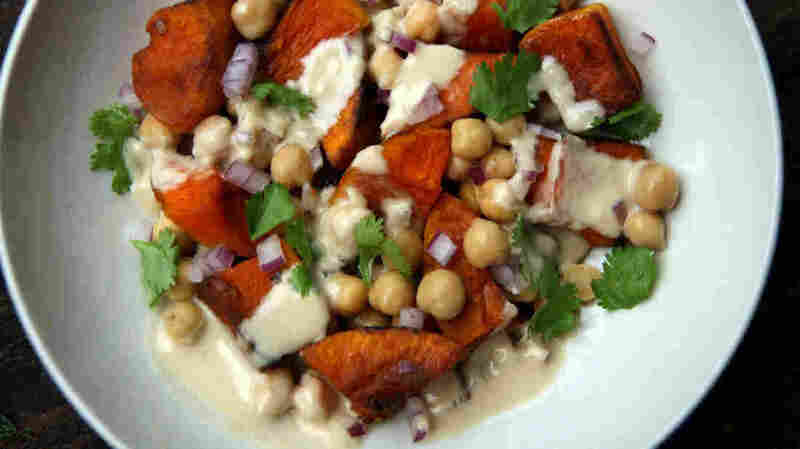 It's a surprising and addictive mix of flavors and textures — dense, warm, roasted squash, slippery chickpeas, bright pops of cilantro and red onion. And a tahini sauce to tie it all together. In a large bowl, combine the squash cubes, garlic, allspice, olive oil and a pinch or two of salt. Using a large spoon or your hands, toss until the squash pieces are evenly coated. Turn them out onto a baking sheet, and bake for 20 to 30 minutes, or until soft. Remove from the oven and cool. Meanwhile, make the tahini sauce. In a small bowl, whisk together the tahini, garlic, lemon juice, olive oil and the smaller amount of water. Add the sugar and salt, taste for seasoning, then add additional water until it thins to a thick-yet-pourable consistency. To assemble the salad, scatter the squash, chickpeas, onion and cilantro on a serving bowl or individual plates. Dress with the tahini sauce and serve. 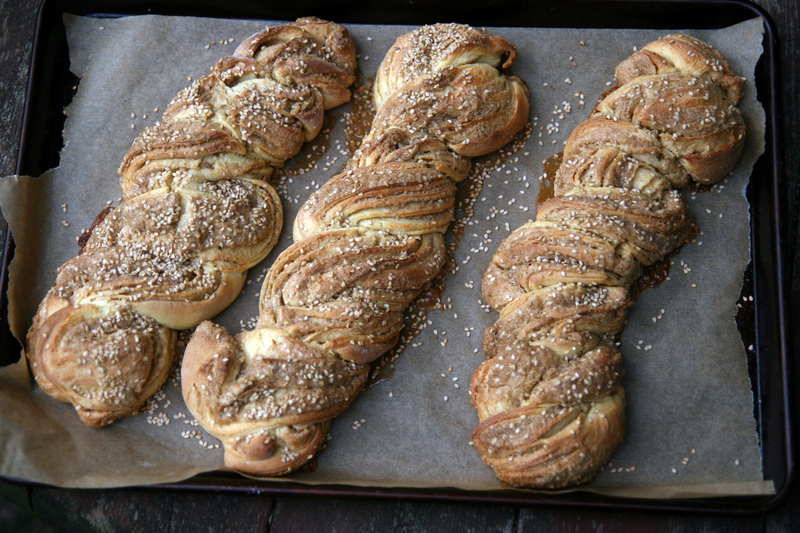 Sweet tahini-filled breads are common in Turkey and Armenia, often enjoyed with a cup of tea or strong coffee. Some versions use a lean, pita-like dough, but this soft, brioche-like take, adapted from the Turkish blog Refika'nin Mutfagi, makes for a nice variation. Pour the water into a mixing bowl, and sprinkle in the yeast. Let soften and bloom for a few minutes. Add the sugar and eggs and mix to combine, then knead in the flour, then the softened butter (a dough hook is best for this). Knead the dough until smooth and supple. The dough will still be very soft and somewhat sticky. Transfer to an oiled container, cover, and let rise for an hour (alternately, you can place the container in the refrigerator overnight). When ready to assemble, mix the filling ingredients until combined. If you've refrigerated the dough, let it come to room temperature for an hour. Line a baking sheet with parchment, or grease it well. Lightly flour a countertop. Take one third of the dough and roll out into a rectangle (the exact size doesn't matter, but you want something larger than a sheet of paper). Spread the dough evenly with a few tablespoons of the tahini filling, then roll the rectangle of dough tightly up around the filling into a log, like a jelly roll. Roll the log out back into a rectangle, spread with another few tablespoons of the filling and roll back into a log again. This time, cut the log in half lengthwise with a sharp knife. Take the resulting strips, and twist them around each other, cut sides up, to form a braided loaf. Transfer the loaf to the prepared baking sheet and sprinkle with a few additional sesame seeds. Repeat with remaining dough and filling. Let the dough rise for about half an hour. Preheat oven to 350 degrees F. Bake for 35 to 45 minutes, until browned. Let cool slightly and serve.